Subaru has pushed all the right buttons and made all the right moves with their lineup, why haven’t buyers responded well to the 7-passenger Tribeca? Sales are booming at Subaru, and it seems like the new 2014 Tribeca would appeal to buyers around the globe, but sales have been sluggish at best. The new Forester SUV, XV Crosstrek and BRZ sport coupe are flying out of Subaru showrooms. What is Subaru going to do with their problem child Tribeca? There’s nothing wrong with the Tribeca, but there isn’t anything that makes it stand out either. The competition in the seven-passenger crossover-SUV segment is very strong. Subaru has done well with their niche market all-wheel-drive vehicles and the brand is growing quickly and attracting new buyers. But they can’t compete in this segment with the Hyundai Santa Fe, Kia Sorento, Nissan Pathfinder, Mitsubishi Outlander, Toyota Highlander and Honda Pilot. 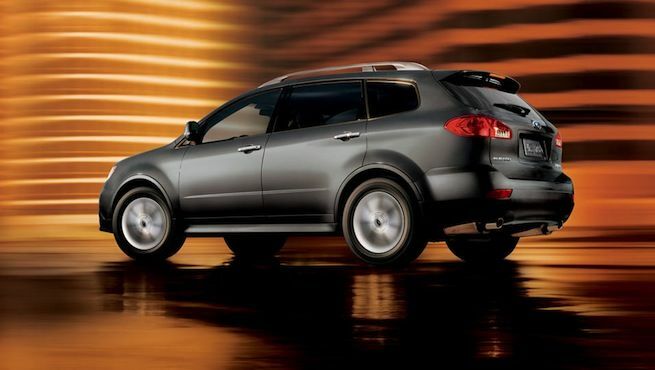 Subaru needs to update the Tribeca or replace it all altogether with a new model. The Tribeca has cramped third-row seating, limited cargo capacity and has an aging design. Subaru recognizes this and there is good news. According to Automotive News, Subaru is working on an all-new seven-seat SUV crossover to replace the Tribeca. It’s been reported that it will arrive within three years. In the meantime, here is the latest on the 2014 Subaru Tribeca that starts at $38,995 Canadian. Subaru Canada has released information on the 2014 model and it still comes with what makes it good. It offers Subaru’s 3.6-liter six-cylinder Boxer engine that produces 256 horsepower and 247 lb-ft of torque. It comes with the excellent all-weather multi-terrain handling of Subaru's symmetrical full-time All-Wheel Drive. It also comes with a long list of standard features. These include a power tilt-and-slide glass sunroof, automatic dual-zone climate control with air filtration, a leather-wrapped steering wheel with integrated audio controls, power-adjustable heated front seats with lumbar support, roof rails, driver and front passenger front and side-impact airbags, side curtain airbags with rollover sensor, power-adjustable heated body-color door mirrors with integrated LED turn signals and multi-reflector halogen fog lights. The Canadian Tribeca is available with optional Limited and Premier Packages. These are further equipped with a standard voice-activated blueconnect Bluetooth. The Limited and Premier Packages also feature body-color rocker panels, wheel arches and lower bumpers, raised-profile silver roof rails, High Intensity Discharge (HID) headlights, 10-speaker Harman Kardon system including subwoofer, as well as leather seating surfaces with a 2-position memory function on the driver’s seat. The Premier Package also adds a DVD-based GPS navigation system. If you are thinking about buying a new 2014 Subaru Tribeca, you may want to wait. It looks like Subaru will do away with the aging Tribeca but still remain in the competitive mid-size SUV segment with an all-new model. Look for a seven-seat Subaru SUV/crossover to be completely new and arrive in global showrooms within the next three years. Come back tomorrow as Torque News brings you all the latest Subaru news.